The years 1648 and 1649 represent a watershed in Jewish history. In Jewish tradition they are referred to as “Tach V’tat” (which are the Hebrew letters representing the numbers 408 and 409, which correspond to the years 1648 and 1649 on the non-Jewish calendar). One can even say that Tach V’tat marks the beginning of modern Jewish history. It is certainly the harbinger of enormous changes in and enormous destruction of the Jewish world. By the 1600s, Jews had acclimated themselves in Poland, Lithuania and the Ukraine. For a period of about 250 years, they had achieved a level of economic stability, if not wealth. They were under the protection of their landlords, the non-Jewish nobility who used the Jews to collect taxes and do their other dirty work, but who in turn provided protection for the Jews from the peasants and other elements that were increasingly anti-Jewish. The most anti-Jewish element in Eastern Europe was the Catholic Church. For reasons not completely clear, the Church saw its role as the agent of punishment for the Jewish people. As such, it never relaxed its pursuit of stirring up the population. This was especially true during the months of March and April of any given year, the period falling out around Easter time. Church leaders regularly preached the guilt of the Jews in the crucifixion of Jesus — and the populous was always prepared to take vengeance. There is no vengeance like the vengeance that is blessed by religious fervor. There is no vengeance equal to the fury of vengeance when paradise is promised for the acts barbarity. This is the backdrop to the events of 1648. According to the reckonings of the Kabbalists, the year 1648 was supposed to be a special year. Therefore, Jews looked forward to the year not with dread but with expectation. One has to also remember that, according to Jewish tradition, the Messianic Era is ushered in by a series of cataclysmic events. It is not something that happens quietly. The “birth pangs of the Messiah” are compared in the Bible literally to the birth pangs of a woman giving birth. Until the baby is born it is a time of pain and discomfort. Therefore, in the Talmud we already see many of the great sages saying, “Let the time of the Messiah come, but let me not see it.” I don’t want to be a witness to such times, because the time of the Messiah is apocalyptic. It’s a time of terrible events: war and dislocation, cruelty, death and destruction — and out of all of those pains a new world is ushered in. Therefore, the messianic hopes for the year 1648 were tempered by the awareness that there would be negative developments. They were not wrong. In 1637, there was a large uprising of local peasants and Cossacks in the Ukraine. Most of the land in the Ukraine was controlled by Polish landlords, who lived in Poland; they were absentee landlords. The feudalistic system exploited the peasants. They could never make enough money working the land to even pay their rent. Therefore, every year they went further and further into debt. The landlord literally owned them. Consequently, a large element of the population was completely downtrodden, exploited and lived under the worst circumstances possible. In the Ukraine there were also a large number of Cossacks. These were a tribe of fearsome warriors – possibly of Asiatic origin – and especially known for their skill as great horsemen. They were also discriminated against and exploited. No matter who owned the land and ran the country the Cossacks would always be considered outsiders. Therefore, in 1637 the Cossacks mounted a rebellion in the Ukraine. It was successful for two or three years. In the course the conflict, from 1637 to 1640, the Cossacks killed about 2,000 Jews. The Jewish victims were killed because they were employees of the Polish landlord. They were tax collectors, who enforced the will of the landlords. These were the typical Jewish jobs of the time. The Cossacks were not about to go to Poland to punish the landlords themselves. But they were happy to take their revenge against those in front of them, the ones who were the living symbols of the oppression – the Jews. By 1640, the Polish landlords reasserted their power. The leaders of the rebellion were caught and executed, and the situation calmed down. At the time it seemed to be the end of the conflict. The situation the Cossacks and the peasants was no different in 1648 than it was in 1640, but now they found a capable leader who organized them and unleashed a revolution that shook the throne of the Czar. That leader was Bogdan Chmielnicki (sometimes spelled: Khmelnitsky). Chmielnicki was a soldier of fortune. He fought for the Poles and the Cossacks against the Turks. He was a great warrior, but he was too charismatic for his senior officers, who were frightened of him and never offered him advancement. By the age of 50, he had very little to show for his service. He was a strong follower of Russian Orthodoxy and hated the Polish landlords not only for their exploitation of the people, but also for their Roman Catholicism. To a certain extent Chmielnicki’s revolution pitted Roman Catholic Polish landlords versus the Russian and Greek Orthodox peasants and Cossacks. He organized bands of outlaws, which always existed, into a large army. In April 1648, he crossed the Dnieper River and headed westward. He proclaimed the independent state of the Ukraine and promised, as all revolutionaries do, that the rich would be despoiled and the poor would inherit the earth. Chmielnicki was able to capture a number of large Polish castles. Each success further fueled his reputation. More and more people, peasants and Cossacks, came to join him. Finally, in the autumn of 1648, about five months after the revolution began, he crossed into Poland itself and captured the famous Polish city of Lvov. When that happened the Poles called a truce. In return Chmielnicki agreed to halt the war. In retrospect, he should have kept the war going. The truce gave the Poles time to reorganize. When they were ready, they repudiated all their deals and hounded Chmielnicki until his end. Nevertheless, in that five month period during the autumn of 1648, he had let the proverbial genie out of the bottle. There were thousands and thousands peasants walking around armed. They had no discipline and had tasted blood. Therefore, instead of going back home to farm their fields, or instead of attempting to build the Cossack state, they turned into a mob of raging killers. The killing was not only directed against the Jews. Roman Catholic clergymen were beheaded. Nuns were raped. Churches were burned and pillaged. Then they kidnapped noblemen and held them for enormous ransom. Even if the ransom was paid, most of the time the nobleman was sent home in pieces. It was a time of terrible, unimaginable anarchy. However, as bad as the situation was, no one suffered the fate that the Jews did. It was estimated that between 1648 and 1653 some 300,000 Jews were killed. That was perhaps 30% of the total Jewish population. Also remember that it was a time that mass murder did not reach the industrial heights it has in our time. Everybody had to be killed by hand. There were no machines, tommy guns, gas chambers or weapons of mass destruction. No matter how dedicated one is to murder, the hand gets tired after a while. Therefore, in terms of the percentage of decimation in the Jewish world and in terms of cruelty and ferocity, the Tach V’tat massacres were akin to the carnage that took place in the Second World War during the Holocaust. There is a book written by a witness to the events, Rabbi Nathan Hanover, called Yeven Metzulah. It is translated into English as, The Abyss of Despair. It is a gripping, first-hand account of the Chmielnicki massacres. The worst atrocities imaginable are described. Being killed was almost a blessing. Those that were not killed suffered fates far worse than death. In the spring of 1649, Chmielnicki himself breached a truce and invaded Lithuania. Many of the Jews from Poland had escaped to Lithuania, which had a strong Jewish community. They thought that they had found refuge. However, the native population — who themselves were being persecuted by the Cossacks — turned against them. Instead of attempting to unite against the common enemy, the “common enemy” became the Jew. But by the end of 1649, Chmielnicki’s fortunes started to change. His allies, the Tartars, had no loyalty. They were bought off by the Poles and switched sides. Instead of supporting the Cossacks, they now fought with the Poles against Chmielnicki. Sensing defeat, Chmielnicki signed the Treaty of Zboriv. It called an end to the hostilities, legally solidified the gains he had made, gave autonomy to the Cossack state and promised that the war was over. However, the Cossacks were not ready to go home after almost three years of uninterrupted war, pillaging, robbery and murder. As a result, Chmielnicki lost control of his alleged army. In 1651, the Cossack army again attacked, but this time the Poles won. In the irony of all ironies, when the Poles won they came to the Jewish area and slaughtered the Jews. They accused the Jews of being traitors – of somehow being on the side of Chmielnicki! In 1652, the Tartars changed their minds again — having milked the Poles for all that they could – and joined Chmielnicki. And the revolution started all over again. Then to further complicate the chaos, in 1652 an enormous plague of cholera swept Poland and Russia. This cholera epidemic totally untethered any semblance of stability that might have remained in whatever surviving pockets of Jewish communities were left in Poland, Russia and Lithuania. The Jews now fled wherever they could. Many landed in Amsterdam. Other Jews moved further east into Russia. For the first time there grew sizable Jewish settlements deep into mother Russia. Finally, in 1653, the rebellion came to an end. The Polish kings and the kings of Russia put down the rebellion in very convincing fashion. It’s estimated that they executed 10-12,000 Cossacks publicly. Chmielnicki himself was executed. The leadership of the revolution was destroyed and it no longer captured the imagination of the people. That decade of upheaval – from 1648 to 1657 — cost approximately 500,000 lives, 300,000 which were Jewish. That makes Chmielnicki one of the leading butchers in the history of the world. He was a person with almost no redeeming social value. However, he is the hero of the Cossacks and the Ukrainians with a statue dedicated to him in Kiev. This period of time — Tach V’tat — loosed forces within the Jewish world that are still present and it raised questions which have never been answered. 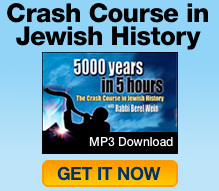 Therefore, historically, it is the watershed in Jewish history. It marks the beginning of this new time. It marks the beginning of lost faith among the Jewish people. There are going to be more and more Jews who are willing to say it’s just not worth it anymore; we just can’t carry the burden any longer.